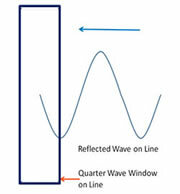 VSWR Stands for 'Voltage Standing Wave Ratio' and is used in EMC to specify the effect of a mismatch. As the electric wave travels through the different parts of the antenna system (receiver, feed line, antenna, free space) it may encounter differences in impedances. At each interface, some fraction of the wave's energy will reflect back to the source, forming a standing wave in the feed line. The ratio of maximum power to minimum power in the wave can be measured and is called the voltage standing wave ratio (VSWR). A VSWR of less than 1.5:1 is ideal, a VSWR of 2:1 is considered to be marginally acceptable in low power applications where power loss is more critical, although a VSWR as high as 6:1 may still be usable with the right equipment. 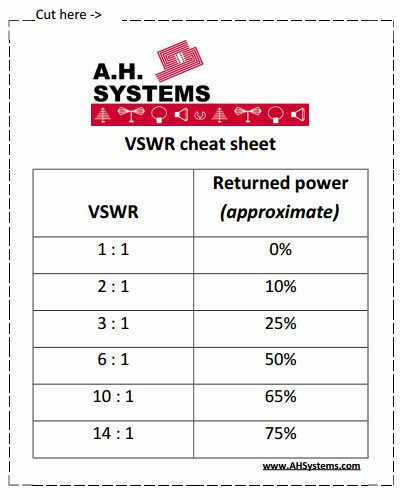 Just in case you don't care for mathematical equations, here's a little "cheat sheet" table to help understand the correlation of VSWR to the percentage of reflected power that will return.